Given the last couple of weeks, it's nothing short of a miracle that my parents are able to celebrate their 39th anniversary today. You'd think there would be more celebrating, but there's really a lot of take-it-easy, take-it-easy [insert Filipino accent here]. That was also the theme when we were making (hobbling?) our way through the streets of Florence last year just after the Save the Couple Wedding. 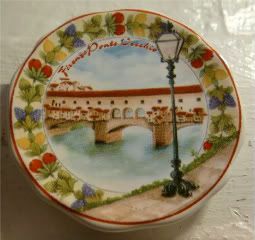 In fact, we just looked down the Ponte Vecchio (Old Bridge), rather than making our way across it. A Medieval bridge, Ponte Vecchio is one of the oldest in Europe - with first documentation of it is around 900. It spans the Arno River in Florence, and is dotted with several different merchants and stalls, with presumably more Florence, Tuscany and Italy magnets than I could ever hope to buy. One thing we missed, though, is the bust of Benvenuto Cellini near the center of the bridge, whose railings the authorities are constantly trying to keep track of. I know, right? Why would anyone bother protecting it? Apparently, lovey-dovey couples from the world over attach padlocks on to bridges (or thereabouts) as symbols of their steadfast love. I don't know how I've managed to miss it, but talk about chains of love, or ball and chain, or bonds of matrimony!